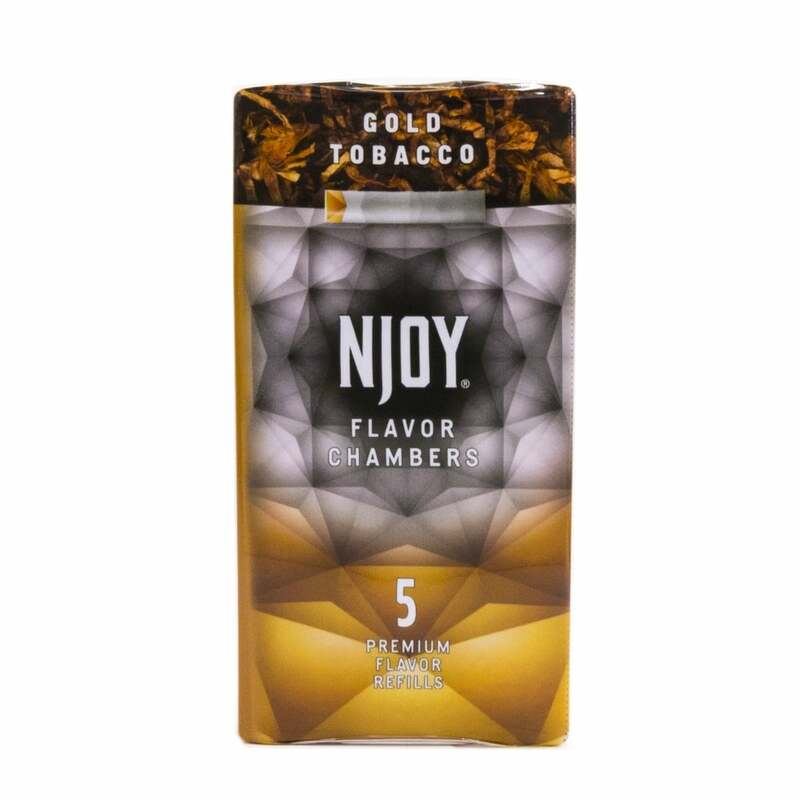 Gold Tobacco, from NJOY Flavor Chambers range is the is a milder version of the Bold Tobacco (which is the most popular of all NJOY flavors). Gold Tobacco is for those looking for a milder throat hit. I received my product fairly quick and was very pleased with the price. However, I ordered 2 five cartridge refills and NOT ONE of these worked!! It's like they were empty chambers. I was very upset and went straight out and bought a Mark Ten!! I quit smoking cigs using this product! These are a good item. Have been Njoying for some time now. Preference is for the Gold flavor chambers . However have recently noticed that some chambers are short lived. More frequently noticing that there may not be as much "juice" in some of the chambers as there used to be. Not consistent. In the last couple of orders I actually had a chamber that was "empty" of any jusice, and one which I was able to get less than a dozen "puffs" out of. May be a fluke, but something to watch for. But will keep buying because I like the concept, the flavor, and the feel. I've used Njoy for three years now after going through numerous other brands. Nothing beats their flavor and convenience. And the prices here are better than on the Njoy site. Enjoy Njoy! I love Njoy, but have had trouble getying them from them. ET is AWESOME. They always deliver!!!! More bang for ur buck than the 2 pk. Fair cig taste. Lasts long time. And 5 pk, not the 2 pack. I am completely happy with this product. Njoy was very reasonably priced a couple of years ago. As their prices increase their inventory decreases and so does the quality. I often receive duds (flavor chambers). but I enjoy the flavor too much to change. The manufacturer runs out of stock way too often so sometimes you have to wait weeks and even months to get this product. I have been enjoying these for several years. I can no longer buy them from the company. but I can get them from The Electric Tobacconist. The shipping is always fast and arrives safely.